This year seems to be flying at some crazy speed, so my mum’s birthday kind of sneaked up on me. Good thing I had a stamp that I had not used before and a beautiful new paper pad I was itching to play with. As the birthday is in spring, I wanted the card to have a fresh feel, so a combination of mulberry pink and mint green shades was a perfect choice. 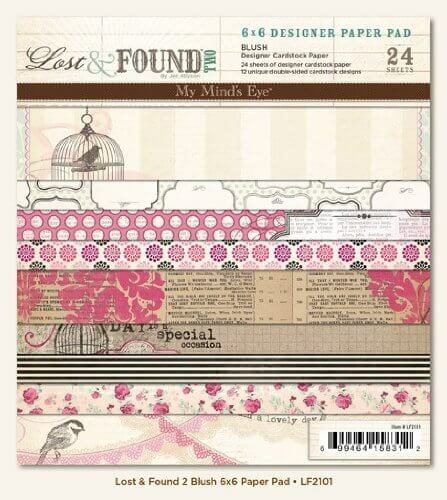 I picked some matching patterned papers from My Mind’s Eye “Lost & Found: Blush” paper pad. I’m a huge fan of older My Mind’s Eye collections, the designs are great and rather unique to the brand, I tend to use them a lot! Once I’ve decided on the layout, I cut my patterned papers to size, distressed the edges using a distress tool (scissors work well too), tinted them with Tim Holtz “Distress Ink” in Frayed Burlap and matted on mint green pearlescent cardstock by Craft Sensations (also inked and distressed). Mint contrasts nicely with the deep mulberry shades and makes each pattern stand out really well. I also added some guipure lace and a mulberry coloured polka dot satin ribbon. I find that polka dots just makes everything look playful. The stamp I chose to be the focal point of this card is the beautiful “Dandy Lion” by Kraftin’ Kimmie Stamps. I coloured the image using Promarker/Brushmarker and Copic markers, then fussy cut it, leaving a thin white outline around it as usual. This helps Dandy Lion stand out better against the background. To create the background, I used Tim Holtz “Distress Inks” in Dusty Concord, Peacock Feathers, Tumbled Glass, and Spun Sugar. I blended all the colours on watercolour paper, then lightly spritzed the whole area with water to allow the inks to blend a little more. I also stamped a few clouds here and there using water to add extra interest and used a heat tool to quickly dry the paper. Once it was dry, I sprinkled some larger water droplets as well as splattered some white acrylic paint. I die cut a mint pearlescent cardstock oval using Spellbinders “Oval Bliss” (S4-474) and tinted the edges using Tim Holtz “Distress Ink” in Frayed Burlap. I also cut the background I prepared earlier with the same die and trimmed it into an oval by hand, so it fit the middle perfectly. I lightly inked the edges of it in “Black Soot” Distress Ink in order to frame it. I then glued the two ovals together and adhered the fussy cut stamp in the middle using 3D foam for maximum dimensional effect. I love adding flowers to my cards and this one seemed perfect for them since I wanted it to be synonymous with spring. I chose a variety of flowers in differing sizes and shades which complemented the colour scheme and overall feel of the card. I also added some stamens, a gem spray and glitter leaves for extra interest of the composition. It wouldn’t be me, if I hadn’t put a bow somewhere on the card, now would it? 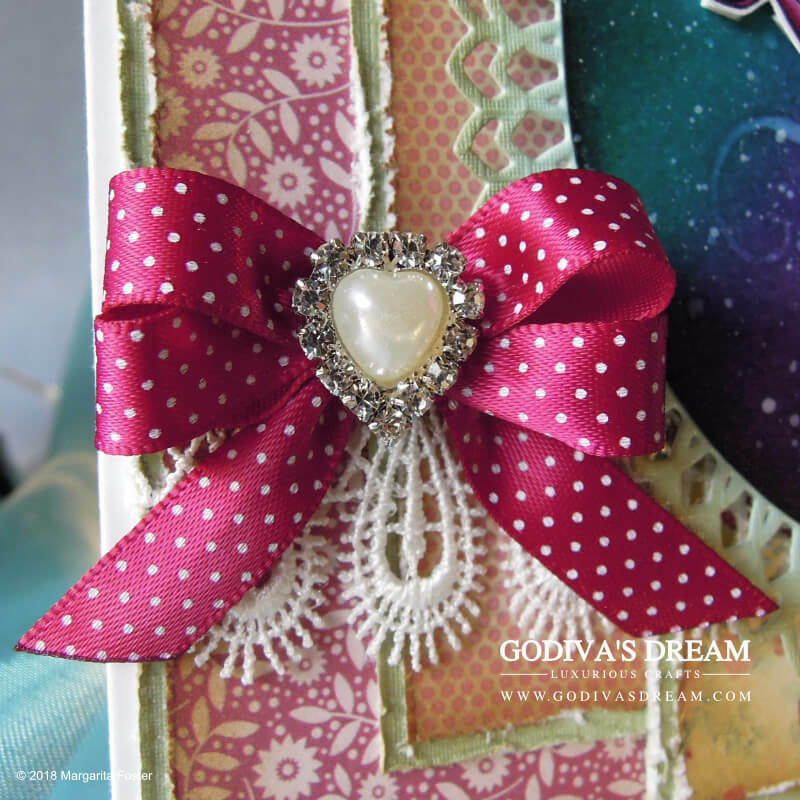 So here it is, my favourite double looped bow with a rhinestone pearl heart middle. The polka dots add the fun element, the shade is quite punchy and gives it an extra pop of colour and the pearl and rhinestones are for a little elegance - perfect. I’m not someone who uses sentiments very often, but I felt that on this card it would look great. Therefore, I chose a stamp from the “Love Circles” set by Wild Rose Studio, stamped it in Versamark, sprinkled pearlescent green embossing powder on the stamped area and heat embossed. I then cut the sentiment out using a stitched circle die and tinted it lightly using Tim Holtz “Distress Ink” in Spun Sugar. I glued the die cut onto a pearlescent mint scalloped circle (Spellbinders S4-124) with tinted edges and adhered it to the card using dimensional foam. Do you tend to match the seasons to someone’s birthday when you create cards? What are your “go to” colours and stamps for spring projects? Looking forward to your comments and thank you for reading.